In a thick bottomed kadai, put the oil and when it is hot add mustard, urad dhal, bengal gram dhal, pepper and jeera, green chillies and chopped ginger and fry till the dhals become light brown. Then add semiya and rawa to the seasoning and fry for few seconds or till it is hot to touch (Need not fry for a long time). Add beaten curd and soak for only 5 to ten minutes. Put the fruit salt on top of the idli batter and pour one tablespoon water on the fruit salt. Then mix well. If necessary add little water and make the batter like idli batter. Pour water in the idli cooker and bring to boil. Grease idli plate and pour the idli batter and steam cook it for 10 to 12 minutes. Make sure the water boils well before keeping the idli stand in the idli cooker. Pl try and let me know your feed back. nice recipie,nice dish,i think it will must be yummy. Fruit salt is a combination of Sodium Bicarbonate and Citric Acid. It is not a substitute for salt. It is used to get the softness in the idli. If you do not have fruit salt, you can use cooking soda, but not in the same quantity of fruit salt, only two to three small pinches. I tried this for dinner 2 days ago along with capsicum saambhar. My husband loved it. 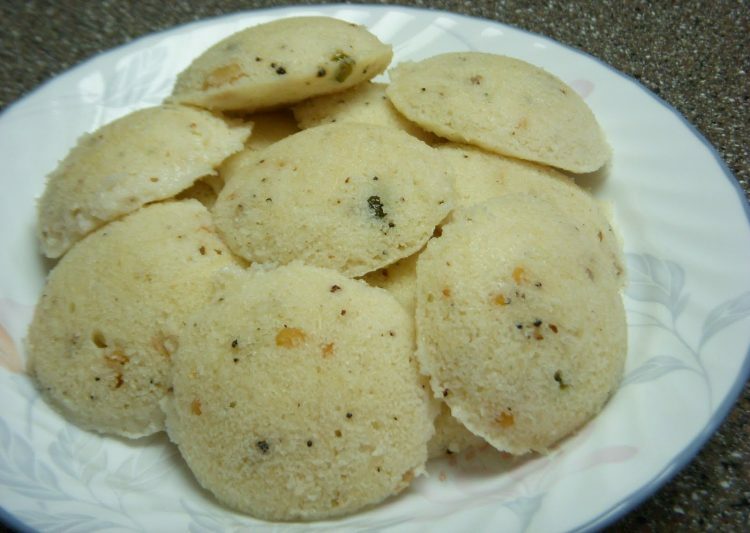 The idlis were not very soft like the usual idlis.. but that could be because the batter was thick. The next day I made with more water and it turned out nice and soft. The spices in the idlies make it so tasty that it can be eaten on its own! Thank you for the recipe! Do we need to grind semiya. No Need to grind semiya. Add as it is. I used eno fruit salt, still Idlis were hard, what is the consistency for the rava semiya batter. Consistency of the batter is like ordinary plain idli batter only. But you have to fry the rawa and semiya before use and also add enough curd to get the batter. Finally you have to add eno fruit salt (not to add directly, but put it on top of the batter and pour little water over the fruit salt. Immediately you will see bubbles come up. Then mix it thoroughly and steam it. Also before keeping the idli plate in the cooker/vessel, ensure the water is boiled well. For this idli I used “Semia” (vermicelli – thin variety). When you soak it along with rawa it will blend well with rawa and you may not see the vermicelli. However when you eat, you will feel the vermicelli taste. You asked about Sevai – which is used in the place of “Idiyappam”. It is not for making idly. If you want to try sevai – you can buy any branded product.